The contract of German manufacturing giant Continental AG for the Bou Craa mine expires in 15 months from now. On 20 June 2020, the contractual obligations of the German rubber company Continental is set to expire. This was confirmed in a letter from Continental to WSRW on 11 March 2019. A subsidiary of German manufacturer Continental AG, ContiTech, in 2015 signed a five-year contract for maintenance of the conveyor belt that Morocco uses to transport phosphate rock from the Bou Craa mine out to the ocean. As it reaches the harbour, the rock is loaded onto ships for transports to clients overseas. The mining operation is done by OCP, the Moroccan government's state owned phosphate company. The Saharawi people object to the trade. The controversies involved in the pillage, has lead to to an ever smaller number of clients purchasing the conflict mineral. The company has previously explained having supplied systems allowing a throughput on the belt of “2000 metric tons per hour and a belt speed of over four meters per second”. 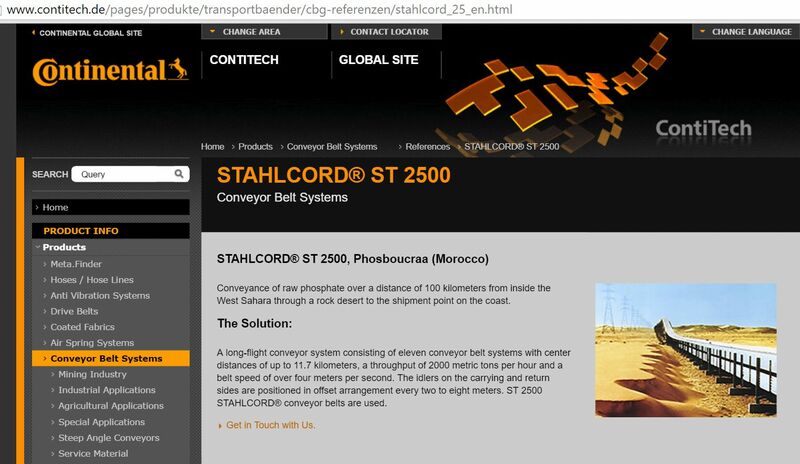 In previous versions of its website, ContiTech stated that Phosbucraa was located in Morocco. In a letter to WSRW in 2017, the company has moved to acknowledge the mistake, and “regret the accidental error that we recognized Western Sahara as a part of [the] Kingdom of Morocco”. According to letters from Continental, the first time the company supplied the Bou Craa mine with a conveyor belt was in 1971, which was during the Spanish colonial reign over Western Sahara by General Franco’s regime. 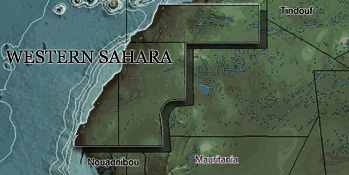 After Western Sahara was militarily annexed by Morocco in 1975, and the Moroccan authorities moved to administer the mines in the occupied territory through the state-owned OCP S.A., Continental “entered into a framework agreement with OCP S.A. to ensure replacement demands when needed” for the conveyor belt. Although Continental states time and again their commitment to “principles in the area of human rights, labour, environment, and anti-corruption”, the company refuses to comment on whether it agrees with the Advocate General of the EU that the right to self-determination of the Saharawi people is a human right.